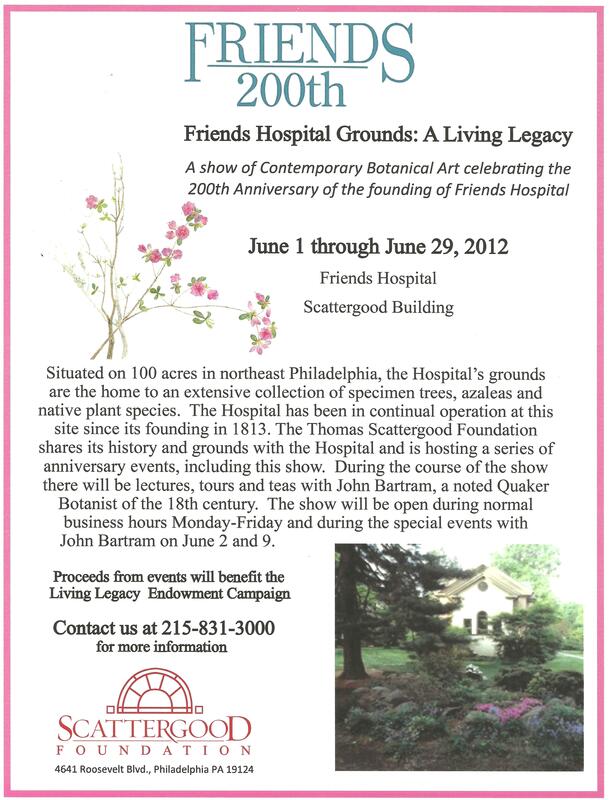 John Bartram Celebrates Scattergood Foundation’s BiCentennial! 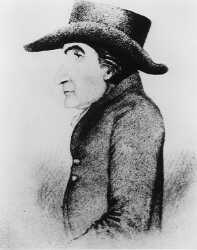 « John Bartram Lives! 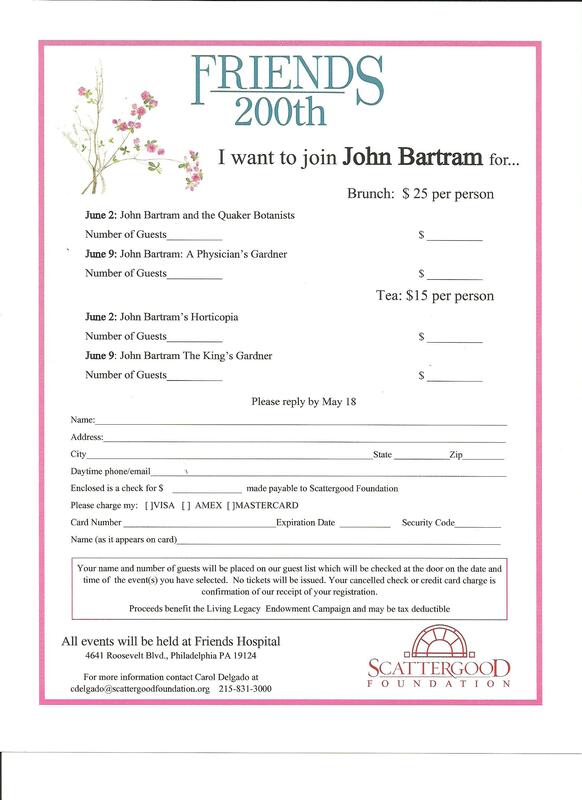 John Bartram Celebrates Scattergood Foundation’s BiCentennial! I will be delivering four new lectures over the next two weekends on the occasion of Scattergood Foundation’s celebration of its BiCentennial. It is an excellent opportunity to focus on the achievements of Quakers in both Horticulture and other Medical and Scientific Disciplines. I am awed by how much has occurred under our direct control for the benefit and future success of the human race. The invitation for the official celebration of the Scattergood Foundation’s BiCentennial Celebration has been sent to numerous recipients in the greater Philadelphia area. It is at times such as these, that we should reflect on the journeys that we have made. We should revisit both the sparkling sun on tops of mountains we have climbed and quiet shade by rushing rivers in the darkened valleys. It is the time to be poetic and allow some brief enjoyment of refreshments and self-congratulations! Time is of the essence. You may yet still register for these special celebratory gatherings. Certainly be aware that the botanical artists’ exhibit is running throughout the entire month. Let us be happy in our country and with its many benefices. The following are the subjects and the descriptions of the lectures that I’ve developed over these last many months and with much additional study. 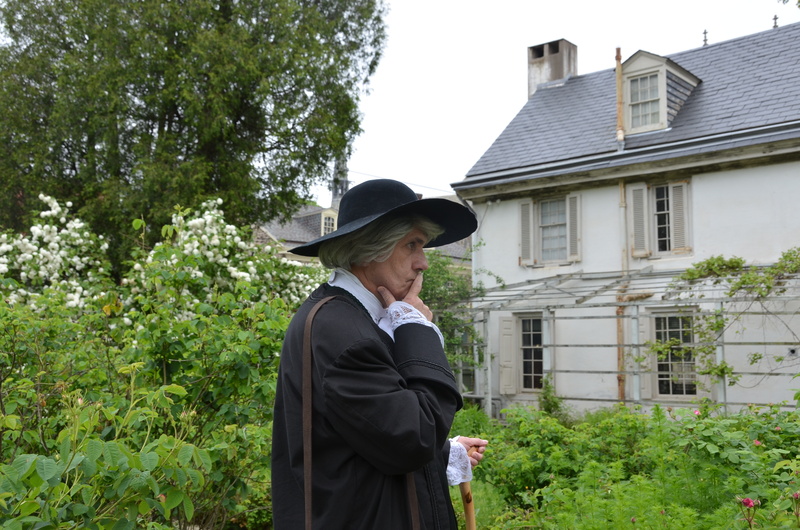 My travels have been extended by visits to others of the major Quaker gardens in the greater Philadelphia area. This is the official Registration publication for the upcoming Bicentennial programming at Scattergood Foundation. Celebrate the Quakers in Horticulture and the Botanical Arts with 330 years of perspective! John introduces the fellow Quakers that worked to define the science and practice of Botany to the world. Their remarkable legacy makes the world richer for the plants that were discovered, the system of nomenclature that was developed and the interaction of old-world aristocracy with new-world exploration. John’s humor, his passion and his achievements will entertain, inspire and awe as he shares his hope for the future of the earth and the men who inhabit it. I walked miles on my many trips to the plantation house of James Logan at Stenton. This was a very familiar return to my educational roots. 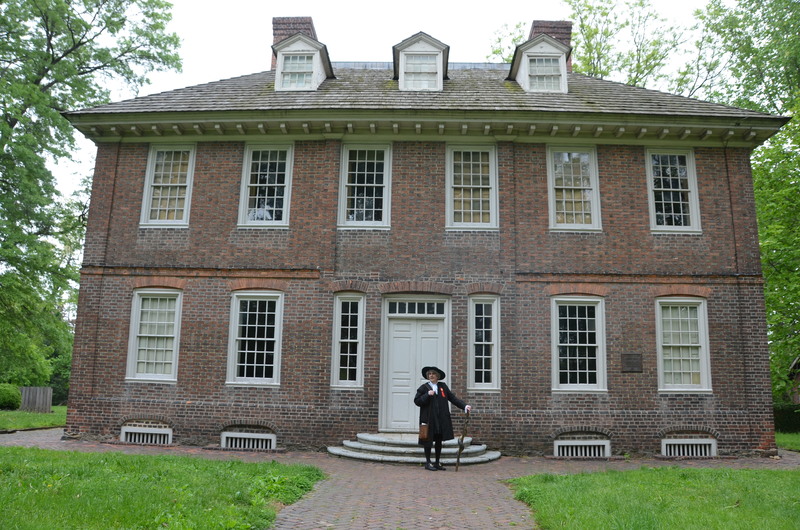 John Bartram will welcome you with the horticultural history of America as it began in Philadelphia and Penn’s Woods. 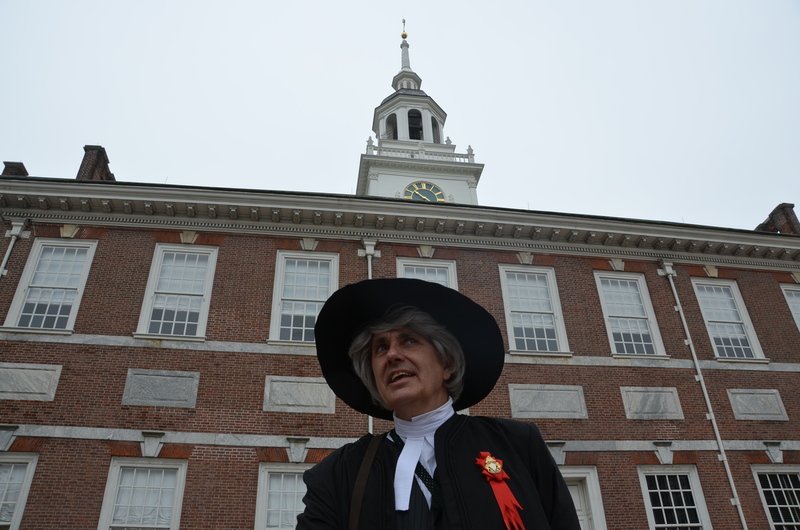 His story starts in 1699 and moves up to the American Revolutionary War and 1776. He stands at the very beginning of the international world of plant discovery and identification. He introduced more than 200 species and 100 trees to the trade. His plant shipments reforested the whole of Southern England and gave color to the island’s autumns with native American trees like Maples, Oaks, Magnolias, Poplars, Hawthornes, Ash, Beech and Willows. 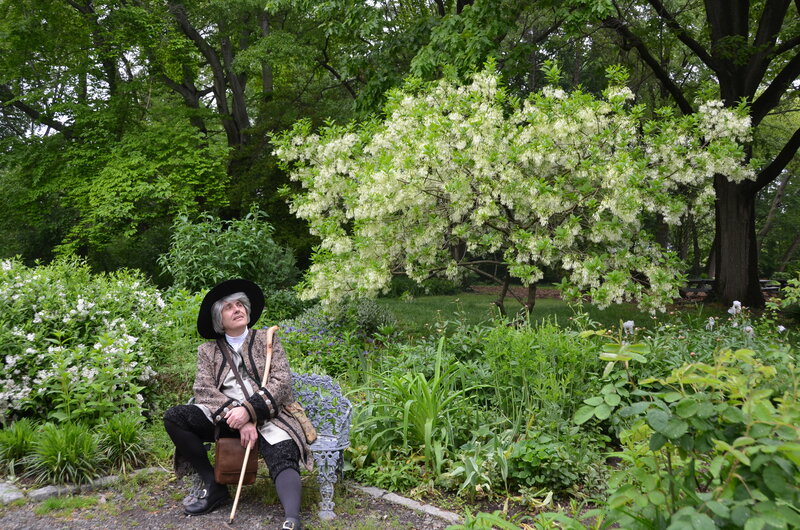 I momentarily rest on my travels through the world and centuries of Philadelphia Horticulture underneath the blooming Chionanthus at Awbury Arboretum. 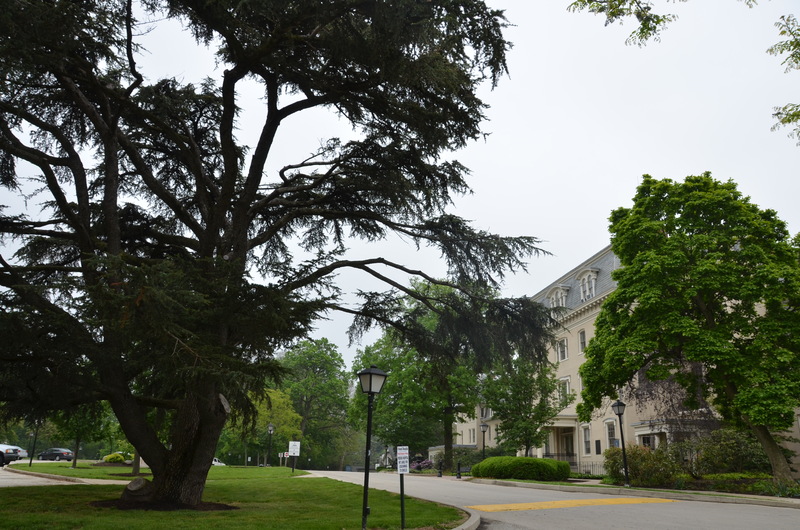 Awbury was home to generations of the Quaker Cope family and their descendants. 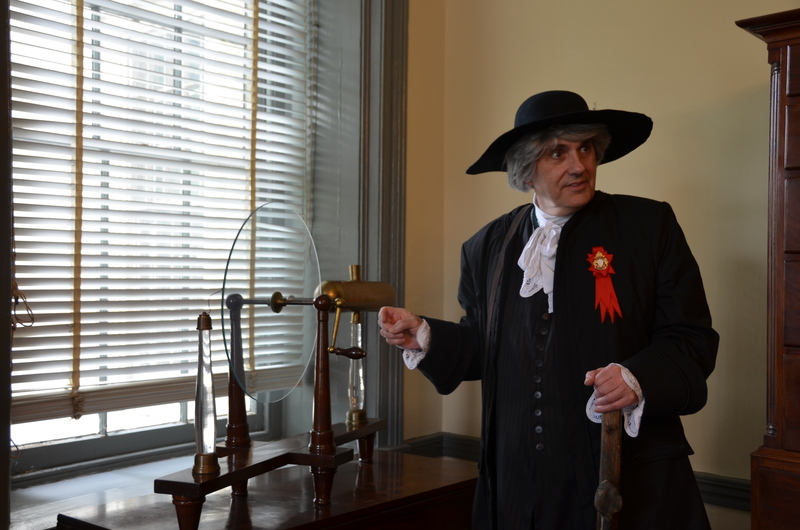 From an early age, John Bartram was a leader in the horticultural world promoting the healing benefits of plants and gardening. His physic garden was a model of the time for the wealth and diversity of homeopathic plant material. His neighbors consulted him for his advanced knowledge and keen eye. His reporting skills and his insatiable curiosity opened the doors that kept him in correspondence with some of the greatest scientific minds of the age. He placed a very high value on the restorative power of nature. I consider the selection of heirloom and historic roses in the garden behind the Wyck House. Two hundred years later, the garden is still full to overflowing with the scent and sense of Quaker Horticulture in Philadelphia. Passionately religious, John’s dozens of plant forays into the wilderness of the original colonies always completed his vision of a God-centered life. He traveled across the Eastern Seaboard and into the wilds of the interior virgin forests. He saw divinity in the spirit of his trees. Along with his son, William, his explorations of Georgia discovered at least one species known only through his collection: Franklinia altamaha. Close friends with Benjamin Franklin, Thomas Jefferson, and George Washington as well as many of the other founding fathers, he is credited with starting the first public garden in America. After years of new plant introductions, John was rewarded with the title of Official Botanist to the North American Colonies by King George III and presented with annuity of 50 pounds per year. 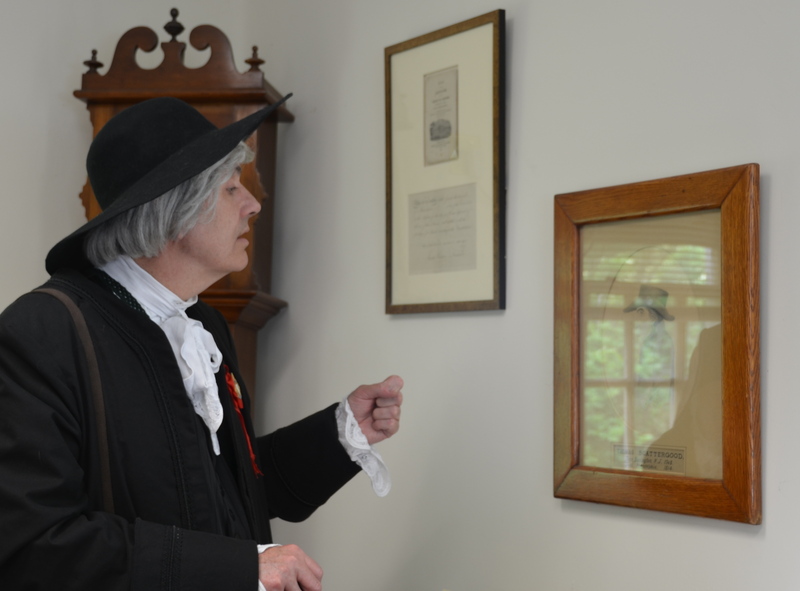 I recognize Thomas Scattergood by his portrait hanging in the Foundation Director’s office. He was minister to his flock and a boon to the community. His life was an exemplar of his good works. Members of our garden club heard you speak at the Scarsdale Womens’ Club in New York just last month. We would like to know if you would do your presentation for our Garden Club. The date would be March 14, 2013.. Our regular meeting is at 1pm but we can work around your travel time and concerns. I am very interested. Where are you located? How many people would be in the audience?